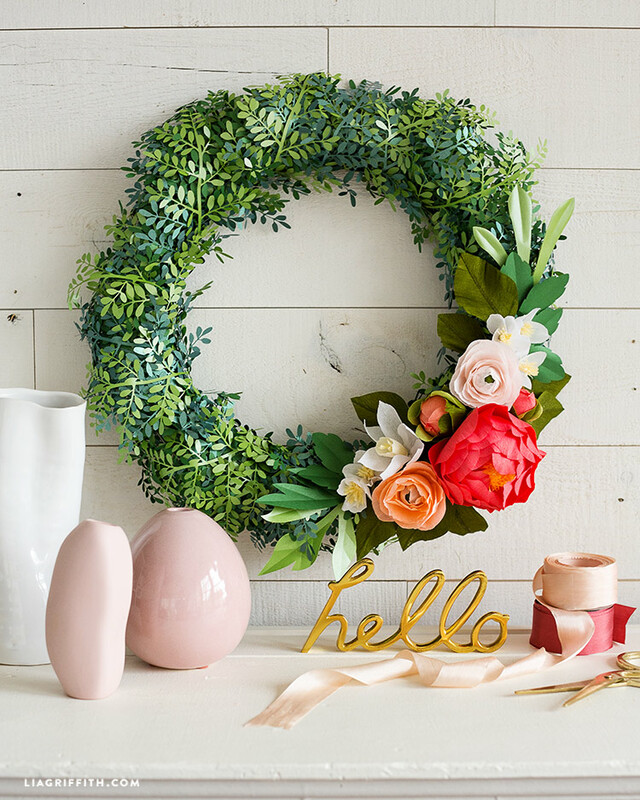 Spring into spring crafting with a bright and beautiful new wreath project! 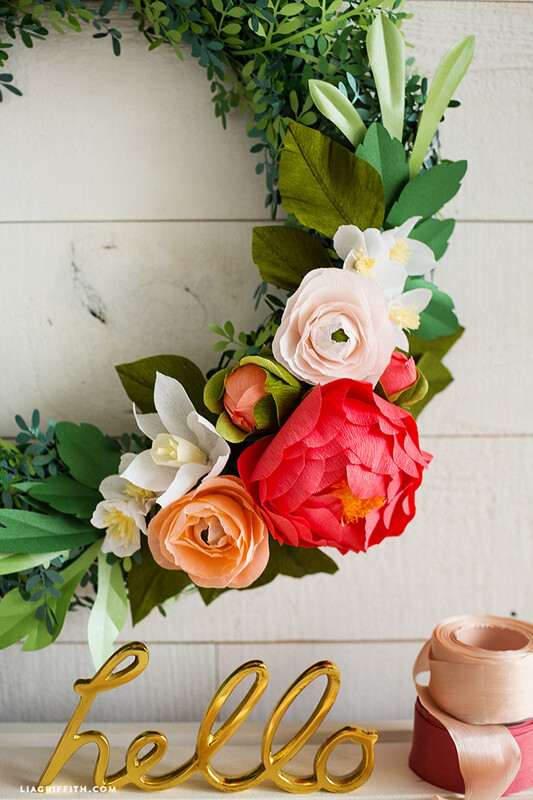 Our DIY boxwood wreath for spring combines our recent boxwood wreath project with crepe paper peonies, ranunculus, daffodils, and a blooming branch. This pretty spring craft project will liven up any wall or door of your home, invoking a fresh breath of creativity. A boxwood wreath is a great way to bring some greenery into your home. And these flowers add such vibrant, gorgeous spring color to your home. 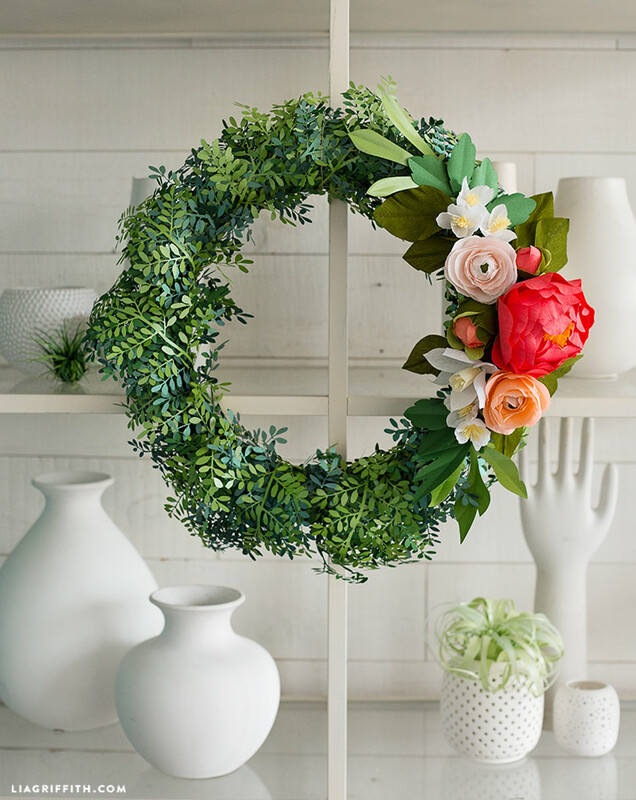 When you’re ready to craft your own pretty boxwood wreath for spring, just click the links below to craft each of these pieces individually. Once you’ve crafted your wreath and flowers, you can assemble your wreath. 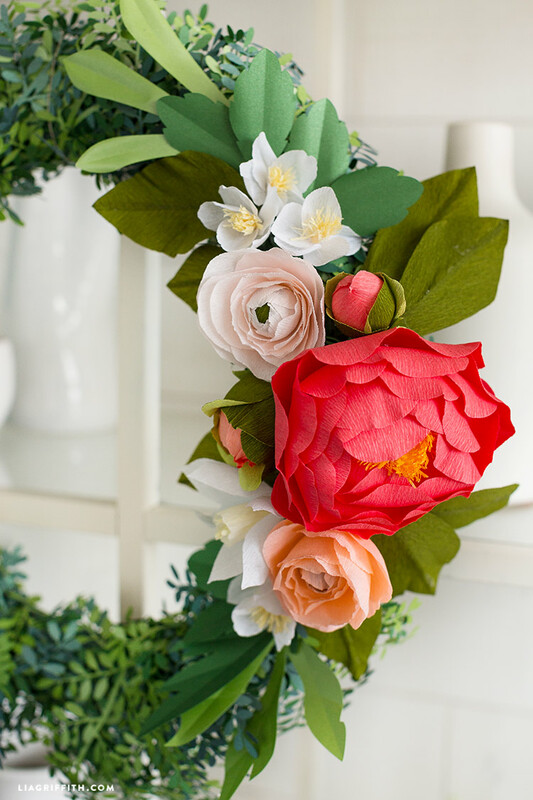 The stems of the flowers stick into the foam core of the wreath very easily — no glue necessary! Have questions about this project? Just comment below. We are here to help you explore your creativity with daily inspiration, downloadable cut files, and printable templates that make your craft life easier. We believe in the power of creativity to nurture the soul and to empower us. Our designs are created with simplicity in mind and we always strive to provide you with the highest quality DIY projects. Remember to share which projects of ours you’ve been working on using #MadeWithLia. You can also post pictures and get support from other makers on our members-only Facebook page. We love to see what you create! Want to join our craft community? Membership gains you access to our full library of DIY project tutorials complete with pattern downloads and instructions. Head over to our membership page to see a full list of benefits. How many of the leaves do you need to print? how do I download without using windzip? If you’re on a PC, right-click the Zip folder and click “Extract All”.